Factory Detroit Diesel Standard software installed & authorized onto a refurbished Panasonic CF-31 computer. The computer is in “new” or “like new” condition, no dings or scratches. 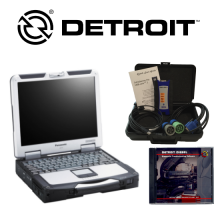 DiagnosticLink™ is a computer-based diagnostic software for Detroit™ powertrain and Freightliner™ Cascadia™ vehicle systems. It can display ECU information, diagnostic fault codes, troubleshooting information, instrumentation and run service routines*. This version includes the abilty to edit & reprogram the ECU**. Read variable values in real time and display them graphically. Play back logs of all connected activity. This USB Link 2 is a PC-to-vehicle interface compatible with multiple software applications, minimizing your investment in multiple brand-specific diagnostic interfaces. Connected to the truck in two methods using a cable connection from the USB Link to the engine / transmission / ABS system. This is the latest Nexiq interface & is required when connecting to PACCAR Davie 4 or DDDL 8.0 when connecting to Freightliner Cascadia body modules.